Stephan's Quintet of galaxies is a well known tight grouping in Pegasus near the bright spiral NGC 7331. 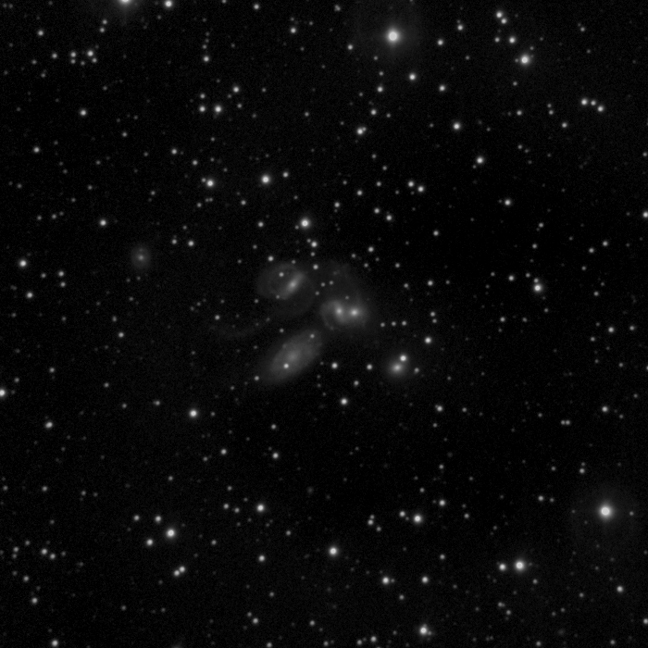 From the small elliptical partially in the field at the western (right) edge, they are NGC 7317, 7318A, 7318B, 7319, and 7320. Much of the continued interest in Stephan's Quintet stems from the fact that NGC 7320 has a relatively small redshift (760 km/s) while the other four galaxies, three of which display signs of strong tidal interaction, all have redshifts near 6600 km/s. If redshift always correlates with distance, the presence of NGC 7320 is a chance foreground projection. NGC 7319 has a type 2 Seyfert nucleus.